Tunisia, Cradle Of Arab Spring, In Historic Presidential Vote : The Two-Way The election pits interim President Moncef Marzouki against challenger Beji Caid Essebsi, who held a post in the ousted regime of Zine El Abidine Ben Ali. 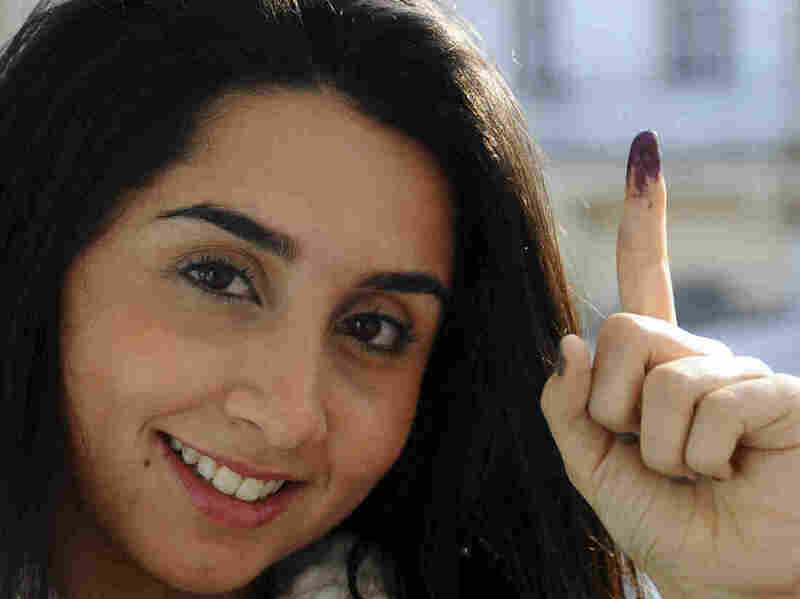 Tunisian voter Dina Ghlisse, 19, displays her finger with the indelible ink mark after voting in La Marsa, on the outskirts of Tunis, on Sunday. More than three years after Tunisia sparked the Arab Spring, the country is choosing a president. Tunisians are going to the polls today to choose a president in a runoff election that represents a choice between the country's interim leader, swept to power in the wake of the 2011 Arab Spring revolution, or a candidate with ties to the ousted regime. An aging Beji Caid Essebsi, who represents the secular-leaning Nidaa Tounes (Tunisia Calls) party and who served under Tunisia's deposed President Zine El Abidine Ben Ali, is challenging interim leader Moncef Marzouki. Essebsi's support comes from the wealthy coastal regions and he has used his experience and the prospect of stability to woo voters. Marzouki, 67, is a human rights activist who was forced into exile during the Ben Ali regime. Marzouki is more popular in the country's poorer south. "The race has been tense as Marzouki's camp accuses Essebsi of trying to restore the old order in Tunisia and Essebsi accuses Marazouki of fostering extremism in the coastal North African nation," says NPR's Leila Fadel, who is reporting from the capital, Tunis. Leila says the last ballots have been cast and that turnout is estimated to be lower that the 64 percent recorded in the first round of reporting. Results in the race are expected on Monday. Tunisia is six hours ahead of Washington, D.C.
As the BBC notes: "The process is being scrutinised not just by international election observers, but also by thousands of Tunisian observers, who are walking around in blue vests and filling in forms." In October, Nidaa Tounes won a resounding victory in parliamentary elections, grabbing 85 seats, or just under 40 percent of the 217-seat assembly.